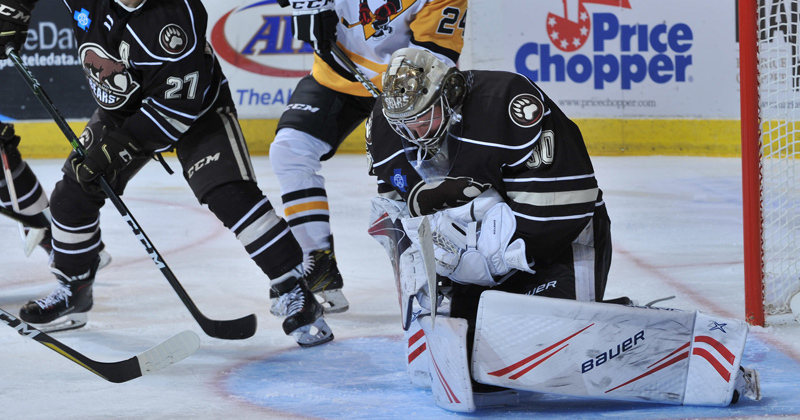 10/17/2018 - The Hershey Bears traveled north on I-81 and snapped an eight game losing streak against the Wilkes-Barre/Scranton Penguins, with a 3-2 win on Wednesday evening at Mohegan Sun Arena. The win was Hershey's first of the season, moving their record to 1-5-0-0. Hershey scored the game's first goal for the second time this season, and first time since Opening Night on Oct. 6 versus Syracuse. On the transition, Axel Jonsson-Fjallby scored his first AHL goal with a rip past Penguins goaltender Tristan Jarry on the short side at 1:40. On the opposite side of the rink from Jarry, Bears goaltender Vitek Vanecek stopped all 13 shots faced in the opening stanza. Shots after 20 minutes were 13-9 Wilkes-Barre/Scranton. Vanecek's bid for a clean sheet extended through the second period with a grand total of 31 stops through 40 minutes. The Bears doubled their lead with 20.2 seconds left in the middle period courtesy of Liam O'Brien's third goal of the season. Connor Hobbs chipped the puck forward at his own blue line to spring O'Brien along the right wing. A quick release beat Jarry low to the ice on the tally. For the first time in the young season, Hershey possessed a lead at second intermission. The Penguins rattled off two quick goals at the start of the third period to draw even. At 2:19, Tobias Lindberg scored on a scrum in front of the net to break Vanecek's shutout bid. At 4:08, the Penguins tied the game at 2-2 on a power play goal by Garrett Wilson on a deflection in front of the net. The Bears retook the lead later in the third period, and former Penguin Jayson Megna scored the eventual game-winning goal in his second game with Hershey. At 6:19, Megna finished a pretty, tic-tac-toe passing play and scored into an open net. Logan Pyett earned the secondary assist on the goal for his first AHL point since Apr. 14, 2013. Vanecek's 40 saves in the win was a new career-high en route to his first win of the season. Due to an injury to Ilya Samsonov, Vanecek's backup was Padraig Carey, a local goaltender who played college hockey at Indiana University of Pennsylvania from 2009-13. Carey often skates with Bears staff and has practiced with the team in the past. The Hershey Bears continue their seven-game road trip on Friday with the first of back-to-back meetings against the Charlotte Checkers. Voice of the Bears, Zack Fisch will have the call on the Bears Radio Network.